Classy Design. Takes a bit of getting used to switching on/off. The base could stand to be heavier but overall I'm pleased. Very nice piece of functional art. It gives off more light than I'd anticipated, which is a good thing for me. I would've given it five stars except the bottom magnet is a bit touchy. I often have to play with it to turn off the light. Oh, and the two wooden balls encasing the magnet kind of glows once they meet. Very cool. 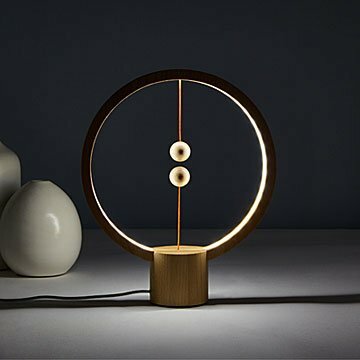 Love the clever design and on/off function of this lamp and the overall aesthetics. I oved this when I received it. However, after only a couple of months, I had to unplug it. It stays turned on even when the two balls are not extended, and if you try to connect the balls, sometimes they won't stay in place. Mine is essentially an expensive sculpture. This was a huge hit!!! He loved this gift and we all wish we had one on our desks!!!! Super cool item!! Just arrived in the mail, I love it! It's simple yet such a statement piece can't wait to use it all the time. I also love how it uses a USB port so you can use it basically anywhere. I love uncommon goods, they always have unique pieces perfect for my dads birthday! This lamp looks like a beautiful piece of functional art. Very attractive design; have already received many compliments. This is a beautiful piece that won't disappoint! My mother is now on oxygen and we can't use candles anymore. This beautiful lamp provides ambient lighting and has a stunning design.